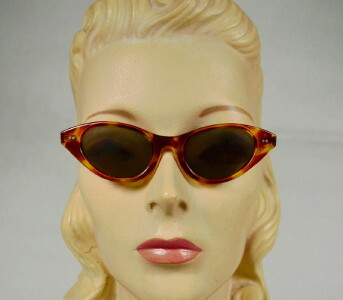 Fifties vintage stylized cateye sunglasses. Brown and golden amber tone faux tortoise shell. Plastic frame. Oval smokey glass lens. Double pin bow connector hardware. Fame height - 1 1/2"
Width measured across frame front - 5 3/8"
Bow length - 5 1/2"